"Mommy, what kind of neopet is that?" "Why is she so ugly looking?" "Because she's a mutant- it's a disgusting, horrible color. Come on now, it's best to stay away from them." My fists tightened around the can of neocola in my paw. I glanced behind me to see the two yellow Shoyrus briskly walking away. Customers in the store talk about me a lot; enough that it shouldn't bother me anymore by now, but for some reason sometimes it still gets to me. I don't know why that mother would think I or any other mutant pet would hurt her or her daughter, but it's common for many pets to fear or avoid mutants, simply because we're ugly. I let out a sigh as I continued to stock the shelf with neocola. When I had emptied the box, I stood up and headed towards the back of the store for another. I hated this job more than anything. Not so much because it was boring, but because of the way the customers and many of my coworkers acted around me. Sure, I had friends, but I could tell that my appearance bothered them sometimes, even if they acted as though it didn't. Even my boss doesn't like me- he's the reason I'm forced to work in the back. I stock shelves, clean the floors, take inventories, and do all the other tasks that nobody else wants to. He won't let me be a cashier because he thinks my appearance would scare away customers. I don't disagree with that, though. I hate having to work where customers can see me, I always feel them staring. I let out a sigh as I dropped the empty box into a trash bin. One of my coworkers was on his way to the break room, and stopped as he approached me. "Getting tired already, Masilah?" the green Bori said teasingly. "I'm exhausted, Cole. Thankfully my shift ends in an hour," I replied. "Aw, what kind of attitude is that? You're making neopoints, at least," he said with a genuine, happy grin. For some reason Cole seems to love his job. He works in the same department as me, and never seems to be in a bad mood. He could work a ten hour shift and still have a smile on his face. "Yeah, well, that's the only reason I'm here. You think I enjoy working in a grocery store? If I could get another job, trust me, I would," I replied. At this, my friend sighed. "Masilah, don't start with this again. Don't listen to that Scorchio. If you actually tried, you could get hired. Not everyone is as prejudiced as you think," he said. "Cole, it's not just what Mr. Wol says, I have truly been turned down in job interviews because I'm a mutant," I said, repeating what I always say. "Alright, well, I'm going to lunch. It's just one more hour; keep your head up, beautiful," Cole said with a wink, and walked away. I rolled my eyes. Cole always called me that, I had no idea why. I always figured he was messing with me, as he always said it jokingly, but sometimes I wished he would be serious. As I crouched down to take a box of neocola, I jumped slightly as my boss's voice came over the intercom. "Masilah, clean up in aisle 4. Food spill in aisle 4, Masilah, thank you." I groaned inwardly, but put down the box and grabbed a mop and bucket and quickly went back into the aisles. I avoided the gazes of other neopets as I made my way to aisle 4. I kept my eyes averted downwards, looking into the soapy water bucket. I could faintly see my dull reflection in the water, and I scowled at it. My rugged mane was sticking up in places- as usual- and my yellow eyes were squinting at the dreadful sight. I tore my eyes away with disdain as I entered the aisle. I immediately spotted the spill and began to clean it up. Somebody had dropped a jar of pickles, and it had shattered, leaving broken glass and pickle juice spread almost completely across the aisle. I scooped up the glass and pickles with a dustpan, and then began to mop up the green juice. I finished cleaning up most of the mess rather quickly, but I continued to add soap to try and dilute the smell. As I continued to mop the floor, a shopper entered the aisle from my right. He looked to be a Lupe from the corner of my eye, but I barely paid attention to him as I didn't want him to look at me. He was at the far end of the aisle, to my relief, but I couldn't help notice as he slowly made his way towards me, studying the contents of the shelves on either side as though he were looking for something. For a moment I almost asked him if he needed help looking for something, but I stopped myself. I know Mr. Wol would be upset if I spoke to a customer without their consent. He told me that I would scare or upset them, and he was usually right. So instead, I waited in case he did ask. Customers rarely asked for my help anyway, but there were no other workers around, and I figured I should stay just in case. Several minutes passed before the Lupe came anywhere near me, and eventually I stopped thinking about him as I finished mopping. Before I turned to leave, however, he stopped me. "Excuse me, ma'am, but do you know where I can find a jar of sauce?" he asked me politely. I hesitated at first. 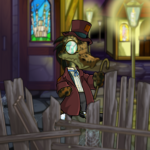 This was the first time I had gotten a good look at his face, and I found myself shocked that this neopet was actually speaking to me. For one thing, he was incredibly handsome. His eyes were bright and kind. His brown fur was sleek and neatly combed. 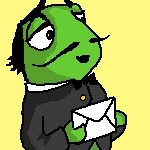 He looked at me as though I were a normal neopet, rather than a hideous mutant Xweetok. I guessed that he was a few years older than me, perhaps in his late twenties, and he was smiling a brilliant, cheerful, white smile. I suddenly felt incredibly self-conscious. I was almost embarrassed to speak to him, I didn't want him to hear my hoarse, and somewhat raspy voice. "Um, it should be in this aisle. Uh, I-I think it's over there," I answered, pointing shyly to the section beside us. The Lupe looked to the left to see the rows of jarred sauces adjacent to the pickles. "Oh, there they are! I can't believe I didn't notice them there! Oh well, thank you for your help, miss!" he exclaimed, taking a jar and putting it into his empty basket. "No problem," I replied, turning back to the mop and bucket. The Lupe didn't walk away immediately. He hesitated, as though he couldn't decide whether to take another one or not. As I passed him to return to the back of the store, the Lupe looked up again. "You know, I couldn't help but notice your gold eyes," he stated with a smile, causing me to stop. "...me?" I asked, looking around to see nobody else around. "Yes, you have the most gorgeous golden eyes I have ever seen." "I... really?" I asked, bewildered. I searched his expression for any form of mockery, but found only genuine honesty. "Absolutely; you're a very beautiful Xweetok," he added, smiling sheepishly. I almost couldn't find the words to respond, but managed to force them out. "Wow... no one's ever said that to me before... I- thank you," I managed to stutter. The Lupe gave me one more smile before turning and walking away. I could only stand there for several minutes, my mind whirling. Had he truly been serious? He thought I was beautiful... nobody has ever called me beautiful. Well, except for Cole, but did he mean it? Robotically, I picked up the mop and bucket and walked to the back, unaware of anybody who may have been staring at me. I glanced at a clock on the wall. It read 6:20. Forty minutes left, but somehow it didn't feel like such a long time anymore. The rest of the day flew by. I emptied one more box of neocola on the shelves out front and by time I had finished, it was 7:00. And I never would have even noticed if Cole hadn't passed me on his way out. "Masilah, you're still here? Usually you're gone the second the clock strikes 7," the Bori commented as I was heading to throw away the empty box. "Oh, right... I guess I lost track of time. I'll be right back," I replied. Cole waited for me by the door, and we walked home together for the first time in ages. "You certainly seem to be in a good mood, for once," he said once we left the shop. I didn't reply, simply shrugging. We were silent for a while, and finally, I spoke. "A customer told me I have pretty eyes earlier. Beautiful, actually," I blurted. Why had I just told him that? Cole didn't seem shocked by the news, as I had expected. Instead, he was the one to shock me. "Well, you do. It's nice to receive compliments from strangers," he said casually. "I wouldn't know; it's never happened to me before," I admitted. Cole stopped at the corner where we would part ways. "I can't imagine why, you really are beautiful, you know?" he replied, shrugging. "No, I'm not Cole; I'm a mutant. How could anyone think I'm beautiful at all?" I demanded. "You really don't think you're beautiful?" he asked. "No, how could I?" I asked. He didn't respond immediately. Instead, he turned to the neohome beside us and gazed at me in the window's reflection. "Look at yourself, Masilah. You're eyes are bright gold, and they glisten. Your teal mane is slick and shiny, and you have smooth, sea blue colored skin. So what if you're mutant? Beauty comes in many different forms," he explained. I stared at myself for a while, taken aback by his words. Maybe he was right... maybe some people just couldn't see the kind of beauty mutant neopets have. As I stared deeply into the Xweetok in the window, my resentment for my own reflection seemed to slowly be fading away, and I suddenly began to see my own beauty. It was like an epiphany, and I wanted to beam at myself. For the first time in my life, I felt proud about the way I looked, even if others didn't approve. I was still beautiful, they just couldn't see it. I finally turned away from the window and looked up at Cole. "Now do you see?" he questioned, and I nodded. "Thank you," was all I could say. "I should get home. See you tomorrow, right?" he asked, lightening the mood. I nodded again, and we parted ways. As I continued down the path to my own neohome, I looked up at the sun setting in the west. It gave me a feeling of tranquility, the beautiful view along with the silent, warm evening. It was a new feeling, but I liked it. Life was good, things will be okay. I am beautiful, and nobody can take that away from me. What Does Luperus Say When You Steal Its Tooth? "GIVE IT BACK! THAT'S NA-CHOS!" "You've ruined so many lives, and I don't think that you care." Welcome to Neopia's annual Gourmet Club Awards! Stay tuned for a surprise twist.